Do you deal with outside contract screen printers? Are you confused by all thetalk of underbasing, flash curing, screen charges, separation costs andmore? Do you know the correct questions to ask when sourcing for a competent screener? This short article willhelp you with some of the common screen printing terms and will detail questions you should ask when shopping fora contract screener. This article is designed more towards people outsourcing large quantity orders. Screen printers come in all sizes and shapes. Some are better suited for short run simple jobs while others are geared to do thousands of dozens per day with ten to fourteen colors in the print. As a screen printing buyer it is hard to know who would be the best suited vendor for a given job or project. Especially if you have no real concept of the process. Without actually working in a screening shop for a few days (not a bad idea), here are some key questions to ask screeners that will help you determine if they are the right company. The number of printing presses in the shop. The number of printable colors per press. The average production rate of each press. The number of flash-cure stations on each press. The maximum imprint size for each press (this is big with today’s all-over prints). These questions seem simple, but they tell a lot about the capability of the company. Can they do oversize prints? The size of imprint area tells all. Can they print on dark shirts where you need to flash-cure between some colors (see Glossary)? You want to see at least one and preferably two flash-units per press if you are going to print on darks.The number of presses will help evaluate if they can handle your needs. Obviously, the number of shifts helps too, but that comes later. Some companies specialize in process color while others excel on dark shirts. Find out what they do best. What percentage of their work is: Process Color on Lights, Simulated Process on Darks, Simple Spot Color, Detailed Spot Colors, Special Effects Inks? Do they use special effects inks? Just because they have all the toys and equipment, don’t assume they know how to use “suede” ink or other exotic inks. Do they do they have a well maintained website and is there a way to approve proofs and track orders online. Some great shops don’t have this but the service is very handy. The top award in the industry is called the Golden Images. They are given in Gold (top), Silver (second) and Bronze (third), by the Specialty Graphic Imaging Association. They use to be called the Golden Squeegee award given by the Screen Printing Association International (now SGIA).Other awards are given by Impressions Magazine at the Imprinted Sportswear Shows and by the now defunct ScreenPlay Magazine called the Terrific T-Shirt Contest. It is very common to see national buyers walking the isles of the Golden Images awards writing down winners names. If you can, attend an industry trade show near you and ask suppliers who their good print customers are. The obvious answer is yes, but will they do them for free or for a charge and will they charge for changes. Do they do other operations such as embroidery? The key question here is do they do other operations in house or do they farm the work out? Can they meet your insurance requirements? What happens if they burn down with your shirts in their warehouse? 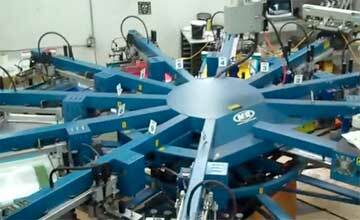 Do they have an automatic folding and bagging machine or is the work done by hand? Can they bar-code, hand-tag, etc.? How many shirts can they comfortably accept and warehouse prior to printing? What reject rate will they guarantee? Will they provide a financial statement? OK, a lot of companies won’t do this but when they are dealing with huge customers like Nike, Reebok and others they have to show they are not going out of business. In your case, they will probably not release this information. Do they have set quality control standards and how do they check quality? This is very important. Having set standards and systems in place shows that production is not everything. What are their art capabilities? Can they do artwork and separations in-house for you or do you need to supply everything ready to go. What is the bottom line? Dark shirts are harder to print on than lights – especially if the design needs to be photorealistic. Make sure to see what they have done. You don’t want to be a training ground here. Process color (CMYK) photorealistic is much more demanding and expensive for the separations. You need printers who are very good technically for great process on lights and darks! Simple spot color is the easiest and fastest to print. The minute you start adding underbases (white ink under colors on dark shirts), flash-curing (you have to dry the underbase before printing other colors on it) and special effects inks, production drops and reject rates increase. By all means, this article is not designed to steer you to the largest printer. Just because they have a room full of presses doesn’t mean they watch quality or delivery times. Smaller printers will often pay more attention to quality because many are owner-operators. Smaller printers can also respond to quick turnaround times dictated by event shirts and special promotion products. In fact if you are their largest customer they will give you their undivided attention. If you need them to add more capacity or including folding and packaging they will often step up. Not matter which way you go, hopefully you will have a better understanding of why a screen printer charges more for underbasing, flash-curing, process color and special effects inks now that you know the terms. Happy shopping. Real Process Color only works successfully on light shirts. Fake or simulated process color is a photorealistic look on dark garments. They usually are a minimum of six colors and generally eight. Most designs require one or two flash-cures and the artwork is separated specifically for this process since designs separated for light shirts will not work on darks without extensive modification. This process is much more expensive for the art and separations and harder to print correctly. It is very common for the printer to go to press and not get a great print the first time. They often have to re-do separations and screens and tweak the image. When you see a great print on a shirt, you don’t know how many attempts were made to get there. Experience really counts when doing high end printing. Most screen printing on garments is done with wet ink going onto wet ink. Certain jobs and most dark garment prints need to have key colors (such as white) dried or cured before another color can print on-top of it. On an automatic press a flash-curing heater replaces one of the print heads. Some jobs also need a short cool-down period before the next color is printed. Therefore, what appears to be a simple six color design with one flash-cure would need a minimum of eight printing stations – six for the colors, one for the flash heater and one for the cooldown. Flash-curing will often slow the production cycle of the job. Commonly used in offset printing, Process Printing uses the four pigment colors of Cyan, Magenta, Yellow and Black – called CMYK. On garments, many “simple” process jobs are actually more than four colors. Designs with lots of specific color matches and heavy text need separate “spot colors.” If the shirt is a light or pastel color, white is also needed. Good process color is much more difficult to do than normal spot colors. A screen is like a printing plate. One screen is needed for each color to be printed. For high end printing (Simulated or Process Color), the screens need to be better than for simple images or loose registration prints. All-over prints require larger screens – more money. Color separations of the art are needed when making screens for the job. For each printable color – a film or mechanical separation is needed. A simple two-color design requires two separations and may take only a few minutes to create with computer graphics. For a process color job a set of separations can be done by a professional separator who may charge $300 to $600. Most shops today use special color separation programs and do the separations in-house for more control. Again, experience counts here. See their samples and ask who did the separations. These are inks that puff, feel like suede, glitter, sparkle, reflect and glow. They are generally harder to use and cost more money. Solid and halftone dot printing of specific ink colors. Generally used for cartoon type designs with broad coverage of inks. When printing on dark shirts, the print normally needs a white layer of ink under the colors to allow the colors to be bright on the garment. This layer of ink is called an Underbase. Most underbases are white and need to be flash-cured before another color can be printed on top. Some designs have more than one white underbase. An lastly, in fairness to the screen printer, if you are purchasing contract printing, don’t forget your printer is entitled to make money. Too many buyers expect printers to do samples for free, make minor changes at no charge, take returns and in general work for nothing. Complex jobs may require extra time reworking the screens and art. Someone has to pay for this. The good news is once the job is fine tuned and samples approved – start the presses!